Excitement for Pirates baseball is as high now as it’s been since the beginning of the 90s. The love for Bonds, Drabek, and Van Slyke has been replaced by the passion for Cole, Marte, and McCutchen. Playoff baseball is becoming the norm in Pittsburgh and there are few ballparks in America as wonderful for as PNC Park. It’s one of baseball’s newer stadiums, but it has a tremendous retro feel. The Pittsburgh skyline behind the bridges and the Allegheny River provides a perfect backdrop. It’s easily accessible from downtown with plenty of pregame fun in the surrounding areas. The quality food items available at the stadium along with a few beers will cement PNC Park as one of baseball’s best ballpark experiences. It’s still easy to find Pirates tickets on the primary market despite the team’s recent success. On the primary ticketing side, you can buy tickets through the Pirates either online, via phone, or at the PNC Park box office. There’s also plenty of inventory and options for the secondary market. Obviously, you have the well-known Stubhub or a ticket aggregator (think Kayak for sports tickets) like SeatGeek and ‎TiqIQ. You’ll likely find cheaper pricing there for off-peak days and opponents than what you could buy on the primary market. PNC Park may be relatively new having been built in 2001, but ticket prices are very affordable. In fact, the Pirates have the third cheapest tickets in Major League Baseball. The Pirates do, however, dynamically price their individual game tickets. Dynamic pricing means the Pirates use a model to reflect the demand for a specific game and increase or decrease the price accordingly. 2015 was the first season that the Pirates used this model for all their individual game tickets. The configuration of seats in PNC Park is tremendous. There’s not a bad seat in the house. You’ll likely want to sit on the third base line if you’re new to the ballpark because you’ll have a better view of the Pittsburgh skyline behind the outfield. The value in the Grandstand is pretty good as tickets are usually in the low $20s and are even cheaper if it’s for a child. The first few rows above the right field fence also provide a unique view since the fence is higher than normal. 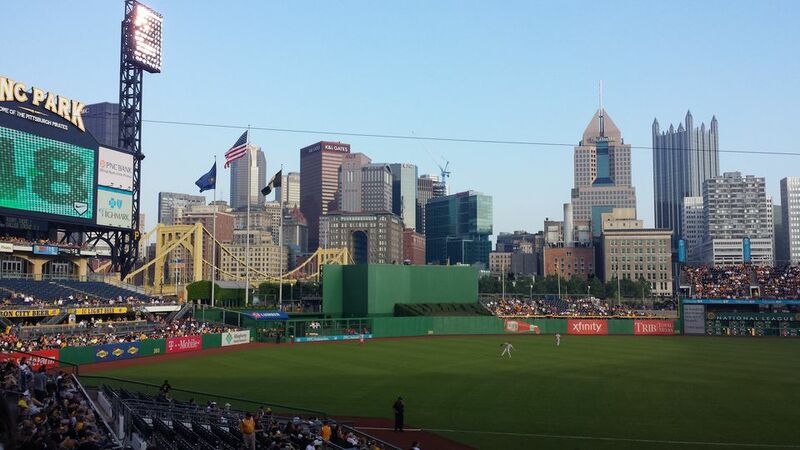 Getting to PNC Park is incredibly easy because of the ballpark’s downtown location. Those coming from downtown are best served getting to the ballpark by making the short walk over one of the many bridges to cross the Allegheny River. Those driving should look to reserve a parking spot in advance if it’s an important game, so that they have don’t have to fight the masses for a space. Otherwise there are plenty of parking lots just north and west of PNC Park. You can also park downtown and then walk over the bridge. Parking downtown is cheaper because it’s further away from the stadium, but it’s likely worth it since the walking distance is so negligible. Fans who want to park downtown and not walk can look for the free light rail (“T” service) that runs right up to the ballpark. There are also plenty of public transportation options. Port Authority bus service has over 50 bus routes that take you downtown and you can walk from there. There’s also a bus to take fans from the Carnegie, Bell, Crafton or Sheraden Stations after you park in one of the public spaces with your car. Fans looking for something different can take the Gateway Clipper Shuttle boat from Station Square to PNC Park. You can also ride on the Water Limo from the Lockwell One Marina in the Strip District, but reservations are recommended. There are plenty of options for food, drink, and even some gambling before a Pirates game. North Shore Drive offers a few typical bars like McFadden’s and the Tilted Kilt or a classier option like Jerome Bettis’ Grille 36. There’s also Soho and Mullen’s Bar and Grill on the other side of PNC Park. The bars in the Strip District are another good option if you’re willing to travel a little further away before the game. The Bee Hive has really good craft beer and Mullaney’s Harp and Fiddle gives you the typical Irish atmosphere. Meat and Potatoes on the other side of the river is by far the best place to sit down and enjoy a full meal before the game. It’s one of the best meals you’ll in Pittsburgh with the poutine and the pork being two of the things you should focus on. Ten Penny is a little further away, but it’s also worthy of a good meal including truffled mac ‘n cheese and the mega meatball being featured. The burger is quite good too. When in doubt, you could also always go to the downtown location of Primatni Brothers. Finally, you could go to the Rivers Casino. It’s located next to Heinz Field, which is just east of PNC Park. There are some nice restaurants and bars to choose from inside, but you’re likely going there to gamble because it is a casino. It has every table game, so it’s a good way to kill time before and after the game. There are also plenty of local favorites including the ballpark’s version of Primanti Brothers, gourmet burgers from BRGR, crab fries from Philadelphia stalwart Chickie’s and Pete's, and the wings from Quaker Steak & Lube. There’s also plenty of beer once you’re ready to wash down that food. Beers of the Burgh is located along the first base line and has plenty of microbrew options like Penn Brewery and North Country Brewery. You’ll also do well at Pub 475 near section 133 for some more microbrews like Bell’s and Victory. There are a decent amount of hotels in Pittsburgh with some even existing on the same side of the Allegheny River as PNC Park, including the Hyatt Place. There are also some options downtown, which might give you some flexibility on plans other than baseball. Wherever you stay, you can use Kayak or Hipmunk again to help with your hotels. Alternatively, you can look into renting an apartment via AirBNB, VRBO, or HomeAway.